From Indonesia’s perspective, the defense of its territorial waters from incursions and the protection of its natural resources from exploitation are key priorities. China’s aggressive behavior in reclaiming the fishing vessel fits a pattern of belittling Southeast Asian states by flaunting their sovereignty. On March 19, the policies of these two countries collided when Indonesian authorities were confronted by Chinese coast guard vessels when towing Kway Fey 10078. The Chinese vessel was suspected of illegally fishing in waters around Indonesia’s Riau province, an area that overlaps with territory claimed by China’s so-called nine-dash line map. The confrontation became aggressive with the Chinese coast guard succeeding in reclaiming the Chinese boat after issuing an ultimatum to the Indonesians. Back in Jakarta, the Chinese ambassador was summoned by the foreign minister to explain the issue. The Chinese Ministry of Foreign Affairs issued a statement claiming the Chinese vessel had been operating in “traditional fishing waters.” Indonesian ministers reacted angrily to the matter, indicating no such traditional fishing rights were granted to Chinese fishermen. Writing about the March incident, Australian commentators have broadly supported the right of Indonesia to assert its laws within its sovereign waters and interpret China’s behavior as a violation of the region’s norms. The view from Australia is that Indonesia enjoys an ambivalent relationship with China, particularly in light of its anti-communist history and legacy as a leading voice in the non-aligned movement. China currently remains a key partner for Indonesia’s investment, and one of the main targets for Jokowi’s push for foreign direct investment to drive economic growth and dire infrastructure upgrades. Indonesia’s more strident response to the incident reflects changes in the country’s political leadership. It is the first time Indonesia has chosen to deal with the territorial issue directly and through the media. Since inauguration, Jokowi has announced his commitment to protecting maritime resources. Jokowi’s global maritime fulcrum vision is predicated on an archipelago that can exercise control over its sovereignty and maritime resources. Early developments in implementing this vision have included the upgrading of the country’s maritime coordinating body into a de facto coast guard and announcing a commitment to crack down on illegal fishing, particularly conducted by foreign vessels. Jokowi has also announced his commitment to boost the Indonesian Navy and Air Force in order to improve surveillance capabilities. From an Australian strategic view, Jokowi’s desire to increase surveillance capabilities coupled with a commitment to patrol the country’s territorial waters is welcomed. One challenge for the president in the defense realm, however, is to contend with the chief of defense force, General Nurmantyo, who is increasingly focused on internal security. The minister for Maritime Affairs and Fisheries Susi Pudjiastuti has been a key figure in the change of Indonesia’s handling of illegal fishing, aggressively enforcing Indonesia’s laws against the activity. Immediately after assuming her portfolio in late October 2014, Pudjiastuti invited the media to watch the first instance in early December 2014 of foreign illegal fishing vessels being blown up. Vessels were also destroyed on national holidays, drawing further attention and publicity to her commitment to implement the president’s policies. Her success and popularity have garnered Pudjiastuti further latitude to enact sweeping reforms of the fisheries industry. Those are positive and necessary steps to strengthen the regulation of fish stocks and support Jokowi’s overall goal of improving Indonesia’s food security. From Australia’s perspective, this is a good sign that certain political actors are prepared to look to the long term in enforcing the law and strengthening domestic institutions. Diplomats from countries like China and Vietnam have protested the policy of destroying boats; however, this has not appeared to deter the Maritime Affairs and Fisheries minister. Pudjiastuti enjoys a reputation as an effective and hardworking minister, but that also ensures confrontations between Indonesian vessels and foreign ones are not likely to go away. The combination of Minister Pudjiastuti’s high-profile approach to enforcing Indonesia’s laws coupled with the president’s publicly stated commitment to sovereignty draws considerably more attention to incidents such as the March confrontation. Indonesia could potentially update and release a public version of its defense white paper in order to articulate how it sees the current strategic environment and strategic priorities. White papers can clearly articulate expectations of partner states and the collaborative role states such as the United States, China, India, and Japan, could play in regional order building. Indonesia’s last white paper, released in 2008, focuses heavily on internal defense and does not adequately capture current complexities in the strategic environment. Some who have seen the unreleased 2014 white paper1 note mention of the South China Sea. An updated white paper would provide further guidance for the Indonesian military’s modernization process, emphasizing the importance of the maritime, as opposed to land, domain. It is not realistic that Indonesia deploys its military and civil maritime assets for the purposes of violent confrontation with China. 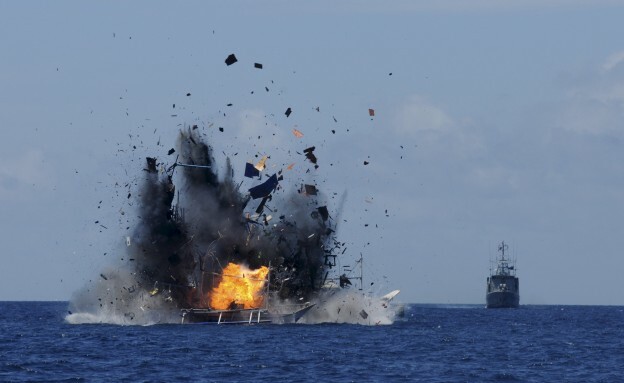 The Indonesian military and coast guard are simply outgunned for now. The March incident also drew attention to the role of the Indonesian coast guard in detecting incursions and enforcing the law. However, as the body’s legal status remains unclear, cooperation and training with its foreign counterparts is currently constrained. Furthermore a lack of vessels, yet to be transferred from the navy, also limits its ability to patrol Indonesian territorial waters. Indonesia’s ability to be able to effectively respond to maritime matters will also require greater institutional coordination between BAKAMLA (the Indonesia Coast Guard), the Ministry for Maritime Affairs and Fisheries (responsible for enforcing policies countering illegal fishing), and the navy. Strengthening these domestic agencies will allow for better information sharing and allow for effective and consistent prosecution of foreign companies engaging in illegal fishing, which can further delegitimize Chinese claims that “traditional fishing rights” exist. In diplomacy, Indonesia could adopt a greater stakeholder role in regional forums. This would also satisfy Jokowi’s desire to see Indonesia return to its former identity as a “great nation.” At present, the Jokowi administration is focused on addressing many domestic issues, however, the March incident highlights the importance of utilizing all tools of statecraft. Despite not being in a declared territorial dispute with China in the South China Sea, Indonesia is now on the frontline of increasingly assertive behavior. Officials in Malaysia and Singapore are increasingly vocal about China’s actions as well. As stated by several commentators, Indonesia could drive the signing of the Code of Conduct in the South China Sea between ASEAN and China. A carefully worded statement that represented consensus among Southeast Asian states that China’s behavior contravenes expected norms and increases regional insecurity would help diffuse potential retaliation against Indonesia alone. One China expert in Australia has described4 the “megaphone” diplomacy approach towards China as playing into a domestic narrative of “the world versus China.” Even if China chose not to uphold the spirit of the agreement, the act of demonstrating consensus among ASEAN states as to the urgency of such an agreement is important with Indonesia’s leadership also sending a clear signal. In recent years, ASEAN states have been divided on certain matters such as the issuing of a communique during Cambodia’s chairmanship of the body. Conversations about the shape of the regional order and whether the rules-based global order, of which the United Nations Convention on the Law of the Sea (UNCLOS) forms a part, will endure must be intensified now at fora like ASEAN, the Shangri-La Dialogue, and the ASEAN Regional Forum, and during various bilateral and multilateral meetings. The Southeast Asia Maritime Security Initiative, announced at last year’s Shangri-La Dialogue, provides Indonesia with the opportunity to expand its maritime domain awareness capabilities. Another option to mitigate tensions would be for Indonesia to pursue greater joint development opportunities with China in fisheries. Framing cooperation in terms of the national interest for both China and Indonesia is a constructive option. It is one of several lines of economic and resource diplomacy that Indonesia might choose to deploy in trying to de-escalate the matter and prevent future confrontations. Australia has a direct interest in the ongoing stability in the region, the security of trade routes, and peaceful relations among Indo-Pacific states. Observing the South China Sea, Australians are relying on a continued US presence in the Western Pacific to act as the tip of the spear in mitigating Chinese behavior, while others see it as Australia’s duty to participate in freedom of navigation operations alongside the United States. As one commentator notes,5 it is in Australia’s greater interest to employ “brain” (that is, diplomacy) over “brawn” in the South China Sea. The following are a series of initiatives that rely on a more indirect approach. There are a number of ways Australia can support Indonesia’s efforts to address rising tensions in the South China Sea. First, Australia can affirm the importance of the global rules-based order at major summits such as the upcoming Shangri-La Dialogue. That is, its voice can form part of a chorus emphasizing that behavior that deviates from the expected peaceful conduct is unacceptable and urging relevant states to resolve their disputes in accordance with international law. In more practical terms, Australia can explore maritime security initiatives with Indonesia under the auspices of fora like the Indian Ocean Rim Association (IORA). Engagement would help increase familiarity with IORA members like India, providing opportunities to discuss regional stability and to encourage cooperation in maritime surveillance. As Australia bolsters its strategic relationship with Japan, there are opportunities to revisit a number of quadrilateral configurations for security cooperation, which could include Japan-India-Australia-Indonesia, other than the more familiar Japan-India-Australia-United States proposal. There are associated risks, however, that China interprets such arrangements as a form of “containment.” Lastly, as one commentator has suggested,6 Australia can offer to help augment the coast guard capabilities of Indonesia through either Australia’s membership in the Heads of Asian Coast Guard Agencies Meeting regime or through the Experts’ Group Meetings of the ASEAN Coast Guard Forum. That said, many of the diplomatic proposals suggested above must take into account the practical limitations of Indonesia’s resources, including7 the issues of coordination and overlap between ministries in responding to foreign policy challenges. Australia will have to account for these limitations in prioritizing which initiatives to pursue. Overall, the confrontation between China and Indonesia in March, while not a new phenomenon, marks the most high profile incident thus far. Indonesia has accordingly put emphasis on its role as an “honest broker,” earnest in wanting to resolve South China Sea disputes peacefully and in compliance with international law. Despite its non-claimant status, the resolve of Chinese fishermen to engage in illegal poaching near or in Indonesian waters coupled with the Jokowi administration’s more muscular anti-poaching stance have left Indonesia in the current quandary. “Business as usual” is not the answer, and Australia’s voice can be helpful in clarifying to the Indonesians the support they can expect as they search for the most suitable response. .
1. John McBeth, “Indonesia, China and the Natuna Islands: a test for Jokowi’s maritime doctrine,” The Strategist, March 22, 2016, http://www.aspistrategist.org.au/indonesia-china-and-the-natuna-islands-a-test-for-jokowis-maritime-doctrine/. 2. Julkifli Marbun, “Supandi to discuss efforts to settle South China Sea dispute,” Republika Online, April 13, 2016, http://www.republika.co.id/berita/en/national-politics/16/04/13/o5khja317-supandi-to-discuss-efforts-to-settle-south-china-sea-dispute. 3. Greg Austin, “China and Indonesia: Joint Cyber War Simulations,” The Diplomat, January 26, 2016, http://thediplomat.com/2016/01/china-and-indonesia-joint-cyber-war-simulations/. 4. Merriden Verral, “Philippines vs China in South China Sea: Tough talking could box China in,” The Interpreter, March 23, 2016, http://www.lowyinterpreter.org/post/2016/03/23/Philippines-vs-China-in-South-China-Sea-Tough-talking-by-observers-could-box-China-in.aspx. 5. Allan Behm, “Australia’s place in US Pacific Strategy: the Expendable Dependable?” The Strategist, March 18, 2016, http://www.aspistrategist.org.au/australias-place-in-us-pacific-strategy-the-expendable-dependable/. 6. Tom Hanson, “Australia must respond to China’s ‘little green fishermen’,” The Strategist, April 5, 2016, http://www.aspistrategist.org.au/australia-must-respond-to-chinas-little-green-fishermen/. 7. Evan A Laksmana, “Jakarta left all at sea by island clash with China,” New Mandala, April 5, 2016, http://asiapacific.anu.edu.au/newmandala/2016/04/05/jakarta-left-all-at-sea-by-island-clash-with-china/.